Maybe it has the names of its prior owners carved into it or maybe a glob of gold nail polish has stained it and left a permanent mark. Maybe it has a faulty handle or a drawer missing. Whichever way it was left, each dorm desk is a vintage item with its own unique story. Most likely a little outdated and a bit of an eyesore, it usually leaves little possibility for style. However, this eyesore serves several purposes. Whether it be to tackle that 15-page research paper you’ve put off or to use as a makeup counter on a Friday night, this piece of furniture is impossible to kick to the curb. So gather those picture frames and your school’s pennant because the dorm desk now serves a new purpose: the focal point. The first step in personalizing your desk is deciding whether it will be used for organization or a nostalgic shrine. If you were like me as a measly freshman, you probably came to college with several photo frames, varying in size and color, with cherubic faces smiling back. It became known that when my friends shared our tearful goodbyes, we exchanged picture frames just as often as a couple of tissues. So, because of my most cherished pals, my desk became a bit of a shrine. An ode to the people with whom I shared ridiculous memories, winning the State Hockey Tournament, eating Perkins at two in the morning and sitting uncomfortably in a hammock after wretched sunburns in Mexico. With barely enough room for textbooks or my beloved French Vanilla CoffeeMate, my desk was comparable to Helga’s shrine for Arnold. But, hey! Your desk doesn’t need to be that way. In fact, here are some great ideas for an adorable desk. The ever-coveted bulletin board is a staple for the college dorm or apartment. Though this piece has been around for quite some time, it will never go out of style. Ever. The way you decorate it is up to your discretion, but as a seasoned collage maker, my bulletin board is coated in glossy magazine clippings, my school’s football game schedule, and a hefty to-do list. The great thing about the bulletin board is that it isn’t stagnant in its appearance. By rearranging what you pin on your board, you change the look of it entirely--très versatile. Bulletin boards are also sold pretty much everywhere and come in a variety of styles. Here are a few great finds. 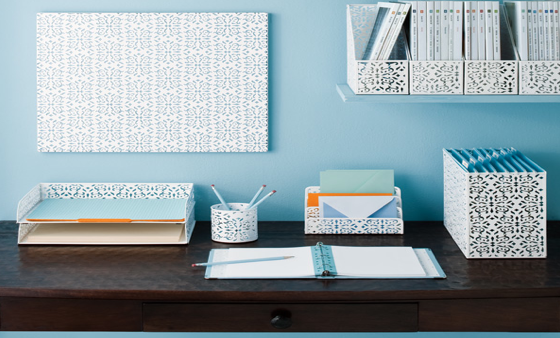 School is also a detail to consider when organizing your desk space. Textbooks, notebooks, pencils, calculators, binders and where does it all go?! Well, as some may understand, clutter = distractions, and procrastination is not an activity you want to take up in those four years of greatness. As someone who gets anxiety around hoarders and thrives off organization, here are some tricks to keep your space clean and chic. Organizers are your best friend. Whether it be a magazine file or a pencil holder, keeping school supplies together will allow you to find what you’re looking for in an instant. Also, rummaging for a pencil under piles of Cheeto bags and old Cosmopolitan magazines can be dangerous. Looking for good desk organizers? Check these out. Use desk drawers to your full advantage, and do not use them as a garbage can. When you move out in May and bid adieu to your humble abode, it’s not going to be a pretty sight dumping out those moldy apples or other snacks you gathered over the year. What should you put in desk drawers? After you’ve got all your No. 2 pencils sharpened and textbooks in their rightful place, fill your space with reminders of home. Whether it be a picture of your faithful mutt or a super-sized mug Mom gave you in support of your caffeine addiction, making your desk yours is solely up to you. However, the frame and mug need not gather dust in the corner of your desk. Add life to that old Polaroid with a colorful frame or use that mug as a temporary flower vase. Creativity is key in the personalization game. Just make sure it suits your style while leaving room for plenty of studying because you’re going to need it. I had the same problem I just bought those push able drawers they come in lots of different colors. You can buy them at Walmart or target they worked out great. These tips are amazing! I love those organizers. I have to decorate my bulletin board as soon as possible! best one i have seen so far, i have been looking for the past hour. Hey, thanks for the nice idea. I can use it tomorrow to decorate my own office-space desk.